It's been a couple of days since I could update. I have been busy with appointments and I've been to tired to get to the computer. Thankfully though, I've been able to keep reading. Since I've fallen behind on the page count, today I will up date on the books I've read and total pages I've read. 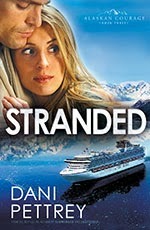 I decided to post my review on Stranded by Dani Pettrey. It was a good story! How is your reading coming along?